(Francisco Kjolseth | The Salt Lake Tribune) University of Utah athletic director Chris Hill says goodbye to friends and staff at the Huntsman Center on Friday, June 1, 2018, before climbing aboard a red Ute-branded Holiday Motor coach bus to the sounds of cheers and applause after 31 years on the job. (Francisco Kjolseth | The Salt Lake Tribune) University of Utah athletic director Chris Hill says goodbye to friends and staff at the Huntsman Center on Friday, June 1, 2018, as he gets ready to climb aboard a red Ute-branded Holiday Motor coach bus, alongside his wife Kathy, to the sounds of cheers and applause after 31 years on the job. (Francisco Kjolseth | The Salt Lake Tribune) University of Utah athletic director Chris Hill says goodbye to friends and staff, including men's basketball coach Larry Krystkowiak at the Huntsman Center on Friday, June 1, 2018, before climbing aboard a red Ute-branded Holiday Motor coach bus to the sounds of cheers and applause after 31 years on the job. (Francisco Kjolseth | The Salt Lake Tribune) University of Utah athletic director Chris Hill says goodbye to friends and staff at the Huntsman Center on Friday, June 1, 2018, before climbing aboard a red Ute-branded Holiday Motor coach bus to the sounds of cheers and applause after 31 years on the job. (Francisco Kjolseth | The Salt Lake Tribune) University of Utah athletic director Chris Hill says goodbye to friends and staff at the Huntsman Center on Friday, June 1, 2018, before climbing aboard a red Ute-branded Holiday Motor coach bus to the sounds of cheers and applause after 31 years on the job. (Francisco Kjolseth | The Salt Lake Tribune) Ex. Secretary Tanya Schmidt flips through a photo book being signed by staff for University of Utah athletics director Chris Hill before he says goodbye at the Huntsman Center on Friday, June 1, 2018, after 31 years on the job. 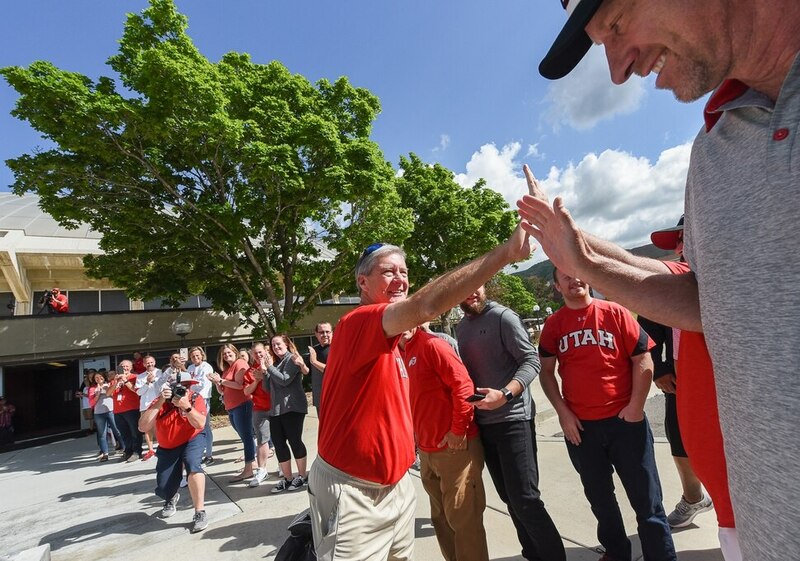 (Francisco Kjolseth | The Salt Lake Tribune) University of Utah athletic director Chris Hill says goodbye to friends and staff at the Huntsman Center on Friday, June 1, 2018, as he gets ready to climb aboard a red Ute-branded Holiday Motor coach bus to the sounds of cheers and applause after 31 years on the job. (Francisco Kjolseth | The Salt Lake Tribune) University of Utah athletic director Chris Hill says goodbye to friends and staff at the Huntsman Center on Friday, June 1, 2018, as he climbs aboard a red Ute-branded Holiday Motor coach bus to the sounds of cheers and applause after 31 years on the job. 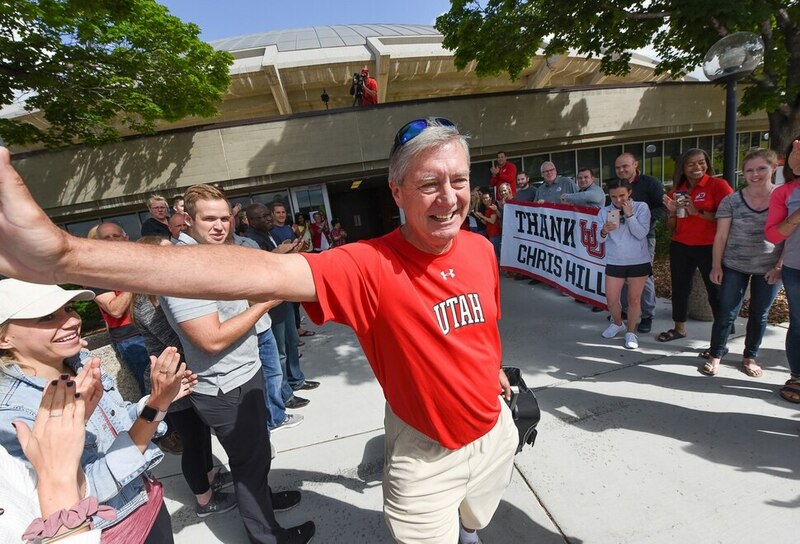 (Francisco Kjolseth | The Salt Lake Tribune) University of Utah athletic director Chris Hill packs away a few of his favorite treats as he says goodbye to friends and staff at the Huntsman Center on Friday, June 1, 2018, after 31 years on the job. (Francisco Kjolseth | The Salt Lake Tribune) Treats express the sentiment by University of Utah staff as they send off athletic director Chris Hill at the Huntsman Center on Friday, June 1, 2018, before he climbed aboard a red Ute-branded Holiday Motor coach bus to the sounds of cheers and applause after 31 years on the job. (Francisco Kjolseth | The Salt Lake Tribune) University of Utah staff applaud athletic director Chris Hill at the Huntsman Center on Friday, June 1, 2018, as he says goodbye and climbs aboard a red Ute-branded Holiday Motor coach bus after 31 years on the job. (Francisco Kjolseth | The Salt Lake Tribune) University of Utah athletic director Chris Hill says goodbye to friends and staff at the Huntsman Center on Friday, June 1, 2018, where some of his favorite treats were ready for him before he climbed aboard a red Ute-branded Holiday Motor coach bus to the sounds of cheers and applause after 31 years on the job. (Francisco Kjolseth | The Salt Lake Tribune) University of Utah staff applaud athletic director Chris Hill at the Huntsman Center on Friday, June 1, 2018, as he says goodbye and climbs aboard a red Ute-branded Holiday Motor coach bus after 31 years on the job. (Francisco Kjolseth | The Salt Lake Tribune) Michael Ruckert, signs a photo book for University of Utah athletic director Chris Hill as he gets ready to say goodbye to friends and staff at the Huntsman Center on Friday, June 1, 2018, after 31 years on the job. 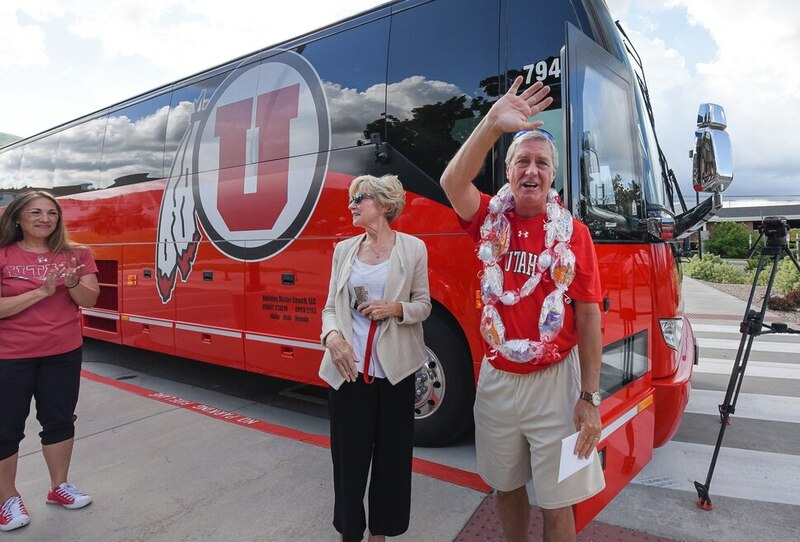 On the day Chris Hill rode off into the sunset in a Utah-themed bus, the Utes also settled on his successor. Utah has hired University of South Florida athletic director Mark Harlan to replace Hill, who after 31 years at the helm, officially retired Friday morning as athletic director at Utah. Leading USF Athletics has been the greatest honor of my career and I cant thank Dr. Genshaft enough. The student-athletes, coaches and staff at USF are all champions. Thanks to them and the amazing fans and donors here, the future is so bright. Forever grateful to Bulls Nation! Harlan, who grew up in Los Angeles, arrived at South Florida in 2014 after serving as a senior associate athletic director at UCLA, where he worked for four years. During Harlan’s time at USF, the Bulls athletic department won 12 conference titles. It was announced just six weeks ago that Harlan signed a new three-year contract extension at USF, which would have kept him as the AD through at least 2020-21. But the chance to move to Utah and back to the Pac-12 was just too compelling. The University of Arizona graduate has a stellar record in fundraising. USF opened a $750,000 student-athlete center last fall and recently the university had announced plans for a $40 million football center. USF athletics had its highest-ever annual fundraising total every in 2016-17, according to his USF bio, which eclipsed the previous high by 300 percent. While at UCLA, Harlan oversaw the men’s basketball program, athletic department development communications, marketing, ticket sales, sponsorships as well as multimedia rights. Harlan also helped raise $125 million while with the Bruins in annual fund and campaign gifts. He also helped steer the completion of a $137 million campaign to renovate famed Pauley Pavilion in 2012 and had a voice in negotiating with the city of Pasadena for an eventual $200 million renovation of the iconic Rose Bowl stadium. Hill told The Tribune in the weeks before he left that he was close to raising the $20 million of the necessary $25 million in expansion for Rice-Eccles Stadium. Harlan’s stellar history as a fundraiser might’ve played a role in him getting the job, while many considered Utah associate athletic director and Hill protege Kyle Brennan, the frontrunner for the position. Before stints at USF and UCLA, Harlan worked at his alma mater in Tucson at the Arizona and also served as an associate athletic director at both San Jose State University and the University of Northern Colorado. Harlan in December 2016 hired former Texas football coach Charlie Strong, who guided the Bulls to a 10-2 record in 2017. The Bulls have gone 29-9 the last three seasons. According to a Tampa Bay Times report, Harlan will owe USF $262,500 — an amount equal to half of his new base salary from an extension he signed in late April — as part of a contract stipulation if he resigned prior to July 1, 2020. Harlan’s annual salary at USF was $525,000. He received a $25,000 raise as part of the extension, which ran through the end of the 2020-21 academic year.